seventh governor, serving from 1818 to 1822. Ethan Allen Brown, Ohio's seventh governor, was born in Connecticut on July 4, 1776. As a young man, he trained for the law in Alexander Hamilton's law office in New York, passing the bar examination in 1802. Brown traveled west in 1803 to lay claim to a tract of land that his father wished to invest in, located near the Ohio River in Indiana. The following year Brown moved to Cincinnati and set up his law practice. He soon became associated with John Cleves Symmes, an influential person in the new state of Ohio. Over time his position as a lawyer brought him into the political arena. Unlike his legal mentor Alexander Hamilton who was a Federalist, Brown chose to ally himself with the Democratic-Republican Party. In 1810, the state legislature elected him as one of three judges on the state's Supreme Court. Aside from a stint as prosecuting attorney for Hamilton County, this was Brown's first political position. He served a full term on the bench, known for his integrity and fair rulings. 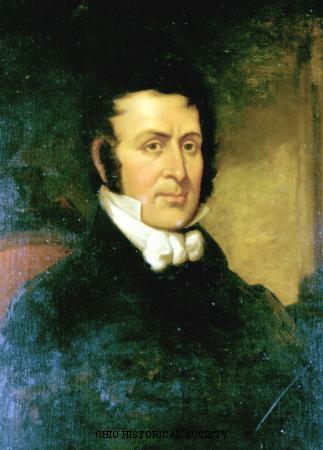 Although reelected in 1817, Brown chose to run for governor in 1818. He easily defeated James Dunlap of Chillicothe, becoming the seventh governor of the state. Although Brown's election was easy to achieve, he soon faced some significant challenges as governor. Both Ohio and the nation entered a time of economic struggle known as the Panic of 1819. Many Ohioans were losing their farms and businesses, and there was a shortage of national currency in the state. Brown and his supporters blamed the National Bank of the United States for Ohio's economic woes. The National Bank's branch in Chillicothe refused to take any state money, insisting on the use of federal currency backed by gold or silver instead. As there was not enough of this currency, known as specie, in circulation, many Ohioans were not able to pay back debts owed to the National Bank. In an attempt to reduce the power of the National Bank in Ohio, the state legislature passed a law taxing the National Bank in early 1819. Legislators went so far as to authorize the seizure of fifty thousand dollars from each of the two branches of the bank operating in the state to pay the taxes owed. This set the state in direct opposition to the federal government. Although this dispute arose early in Brown's first term as governor, it was not resolved until after he left office. The federal government eventually sued Ohio in the United States Supreme Court case Osborn v. Bank of the United States (1824), a ruling that declared the practice of taxing the National Bank unconstitutional. In addition to the state's battles with the National Bank, Brown advocated the improvement of Ohio's infrastructure as a way of improving the economy. In order to send their crops and other products to market, farmers and businessmen needed better transportation routes. Brown believed that a system of canals offered the best solution to the state's transportation woes. He argued that the legislature should use the proceeds from the sale of federal lands to pay for canals that would link the state's major waterways. To that end, Brown helped to establish a canal commission, which had himself, Thomas Worthington, and Alfred Kelley among its members. Over time, Brown became known as the "Father of the Ohio Canals," although his critics referred to the canal project as "Brown's folly." He remained a staunch advocate of canals long after his time as governor was over. Aside from economic issues, the governor worked for other improvements in the state as well. In 1821, the state began a process of creating a public school system. The legislature voted on January 22, 1821, to begin dividing the state into school districts and to aid in the funding of these schools through a statewide tax. In addition, the state also began to provide some funding for an insane asylum located in Cincinnati. On January 13, 1822, Brown left the governorship to represent Ohio as a United States senator, replacing William A. Trimble who had recently died. Allen Trimble served out the remainder of his term as governor. Brown served as a senator until 1825. He became a supporter of Andrew Jackson, eventually becoming a member of the new Democratic Party. As a reward for his support, Jackson named him as minister to Brazil in 1830, where he remained for four years. From 1835 to 1836, Brown served as Commissioner of Public Lands, but then chose to retire from politics. Now sixty years old, Brown moved to his father's property near Rising Sun, Indiana. He did not stay retired from politics for long, serving in the Indiana House of Representatives from 1841 to 1843 and remaining active in the Democratic Party. He died on February 14, 1852, and was buried on the family estate. Still, John S. "Ethan Allen Brown and Ohio's Canal System." Ohio Historical Quarterly 66 (January 1957): 22-43. Still, John S. "The Life of Ethan Allen Brown, Governor of Ohio." Ph.D. diss., The Ohio State University, 1951.